Sleuth was reading this article about Waterstone’s getting rid of the apostrophes in their name and calling themselves Waterstones so he sent in a letter. Sleuth and Lynda Moyo were talking about names and how they can be abbreviated. This was caused by Tough Nun Moyo musing on Beyonce’s baby’s name Blue. She even was inspired to write a piece called ‘Baby Names: Is Beyonce’s Blue For You’. The chat moved on to how people describe themselves. “I know someone who’s known as Matt but writes it M@,” said a scribbler in the office. “And when he gets something wrong does he call himself Tw@,” said another. Men CalendarThis was spotted by Sleuth’s colleague at Place North West and as he wrote: ‘The GM Business Week 2012 calendar sent out by the Manchester Evening News chose this image of Spinningfields for January. Not just any part of Spinningfields' millions of square feet, but a vacant floor of an office building on Hardman Street. Speaking of MEN departures the sign has finally come down from the MEN Arena which is now just the Manchester Arena. See below for the ghostly impression of the old name. Not that some older folk will notice, as Sleuth knows one or two who still refer to it as The Nynex Arena, after about fifteen years of it not carrying that name. Still some people call Manchester Central, G-MEX, and House of Fraser, Kendals. Sleuth loves this just over the border into Yorkshire. The take-away pictured to the right is on the way to Todmorden and perfect if you feel peckish. And it’s USP? Well we’ve had drive-thru McDonalds, and drive-thru KFCs, now there’s Drive-by Pie. Sleuth’s going to pitch the idea to Greggs - he should make a fortune. Sleuth met Gordo on New Year’s Day for a drink. Gordo had brought a present in a plastic bag. Everywhere was closed apart from the Waterhouse, a Wetherspoon’s pub, on Princess Street. Sat at a nearby table were two charming Americans with outlandish trainers on their feet who turned out to be pilots on a stop-over. The ‘sneakers’ helped them relax apparently. Sleuth and Gordo made the Americans come out drinking. This being a Sunday on New Year’s Day it was hard to find anywhere open. They had to settle on the New Union in The Village. Gordo revealed what was in the bag: it was a three foot long side of beef, vacuum-packed with blood running underneath the polythene, it looked like a severed arm. Once people had got used to that and this being the New Union, there was some amusing, if childish banter, about the size of meat Sleuth was packing. With the Americans packed off to recuperate before piloting planes out of Manchester the following day, Gordo and Sleuth went for a meal at Spanish restaurant El Rincon. After a meal and a needless bottle of industrial strength Rioja, the pair were ready to call it a day. But then Rafa, the owner of El Rincon, sent over another bottle of the super-strength Rioja he keeps by for making fools of already merry people. Sleuth can’t remember its name, but when Neil Sowerby emailed him this picture of a bottle of wine, the name seemed to ring a bell: certainly in describing how Sleuth felt the following day. Mario Balotelli has decided to buy Carlos Tevez as an act of charity, and to keep him at home as gardener with special duties to keep the bench warm. It's still Kendals for me; Harrods didn't kill the name, neither will House of Fraser, especially when it's etched above the central entrance. Doesnt slueth liked to call Noma angel medow? 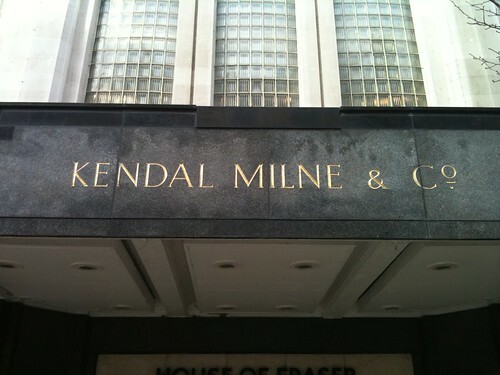 Er, did somebody change the name of Kendals? I really hadn't noticed.